This Pinup Photo was added on Wednesday 16 July, 2014. "First to Fight: Airborne Paratroopers"
In addition to many propaganda posters showcasing the calls to ration, buy war bonds, work hard in the factory, keep quiet, and much more; another popular type of poster were those that would promote the different branches of the Military. From women in the military to the different jobs you can have, these posers almost glamorized these jobs as if to be movie posters for real life. Here, Brittany showcases the US Airborne Paratrooper forces that were the first to fight being dropped deep behind enemy lines. 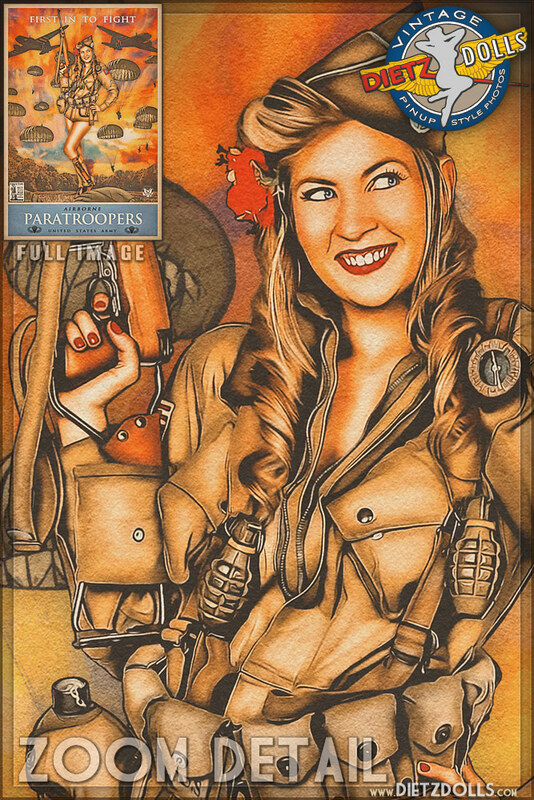 Brittany is wearing 82nd Airborne uniform pieces and carrying an M1 Carbine rife, favored by WW2 Paratroopers.